Have you ever wondered why babies and puppies always put everything in their mouths? The lips are probably our most sensitive form of sensor as they have the most nerve endings, literally thousands of them. This is followed by the fingertips and, not mentioning the naughty bits in between (this is a family publication), the soles of the feet and toes come third. So no, we didn’t have to take our shoes and socks off for the reflexology demonstration with Avril Holland on 23rd October, because we were able to do it on our hands instead. Very handy! 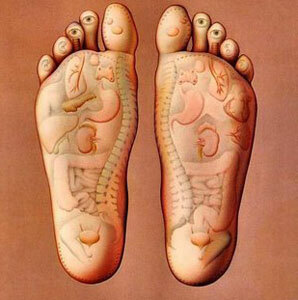 Both the feet and hands replicate the body, with meridians that correspond to various organs and areas. By creeping your thumb caterpillar-style over the appropriate contact point on either, you can relieve various conditions and symptoms. If you have a serious problem with a given part of the body, you can often feel a crystal build up of toxins in the corresponding area of the hands or feet. Breaking it down can be quite painful, but once achieved, drink lots of water to flush the toxins away, and you will find the original problem is considerably relieved. Better still, a qualified practitioner will do it for you. As with all these alternative healing therapies, the main objective is to bring the body into balance and harmony, and reflexology can support patients with a variety of ailments, from sinus to heart problems. Speaking of which, best wishes to our Chairman, Peter Golding, who has recently had a pacemaker fitted and is doing well.